The Singapore Government and OpenPEPPOL has 21st of May signed an agreement on establishing a PEPPOL Authority in Singapore. With the agreement, Singapore is the first country in Asia and the first outside Europe to establish a PEPPOL Authority. 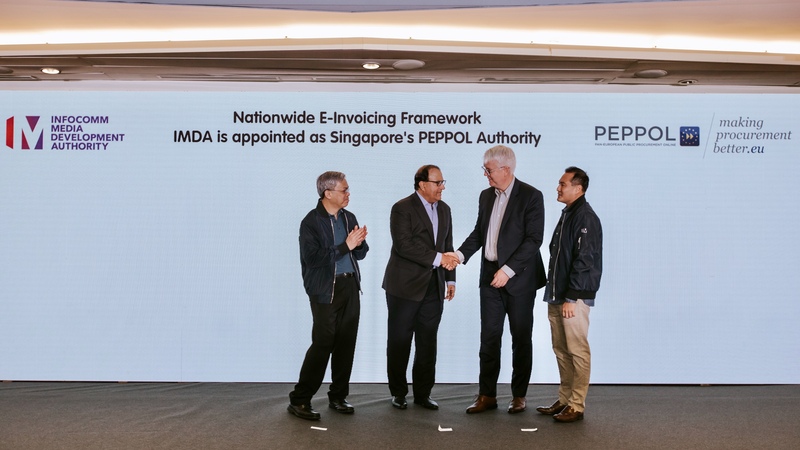 The agreement on establishing a PEPPOL Authority is made between the Info-communications Media Development Authority (IMDA) on behalf of the Singapore Government and OpenPEPPOL. It was signed in an event in Singapore 21st of May by IMDA Chief Executive, Mr Tan Kiat How, and OpenPEPPOL Secretary General André Hoddevik. As Singapore’s PEPPOL Authority, IMDA will set national rules and specifications that meet Singapore’s domestic requirements, as well as appoint and certify service metadata publishers and Access Point (AP) providers. IMDA will also ensure conformance to the PEPPOL technical and service standards. Singapore aims to use the PEPPOL eDelivery Network and the PEPPOL Business Interoperability Specifications (PEPPOL BIS) both to support business with the Government, and to enable interoperability between Singaporean businesses, their European trading partners and beyond. The priority is to enable electronic invoicing but implementing PEPPOL support also for other parts of the procurement process will be considered. There is already a strong interest among Singaporean service providers and European service providers with a presence in Singapore to implement PEPPOL in support for their Singaporean customers. IMDA has initiated the process for establishing the PEPPOL Authority. In the coming months, IMDA will put in place the e-invoicing framework for technology solution providers to join the network and bring on board their corporate customers. This will also include working out the details for awarding and certifying PEPPOL Access Point(s) and Service Metadata Publisher(s). Interested parties are encouraged to refer to imda.gov.sg/einvoice or email einvoice@imda.gov.sg. The Infocomm Media Development Authority (IMDA) leads Singapore’s digital transformation with infocomm media. To do this, IMDA will develop a dynamic digital economy and a cohesive digital society, driven by an exceptional infocomm media (ICM) ecosystem – by developing talent, strengthening business capabilities, and enhancing Singapore’s ICM infrastructure. IMDA also regulates the telecommunications and media sectors to safeguard consumer interests while fostering a pro-business environment and enhances Singapore’s data protection regime through the Personal Data Protection Commission. For more news and information, visit www.imda.gov.sg or follow IMDA on Facebook IMDAsg and Twitter @IMDAsg.